Sidney Charles Masters was born on 11 June 1895 at 25 South Street, Yeovil. He was the son of glove cutter Frederick George Masters (1866-1935) of Yeovil and Emily Delamont née Gillingham (1862-1937), originally from Bridgwater. In the 1901 census Frederick and Emily were listed at 25 South Street with their children; Emily Mildred (b1890), George (b1892), five-year old Sidney and Nellie (b1898). By the time of the 1911 census the family had moved to 62 Queen Street. With Frederick and Emily were Mildred, George, Sidney and Nellie as well as three new children; Rose Annie (b1901), Minnie (b1904) and Arthur (b1905). 15-year old Sidney gave his occupation as a house boy on a farm - which was Newton Farm run by Mr James. Sidney later worked at the Yeovil Gas Works until his enlistment. The family later moved to Park Street. Although it is not known when Sidney enlisted, he enlisted in Yeovil joining 8th (Service) Battalion, Somerset Light Infantry. His Service Number, 17688, suggesting he enlisted during the early part of 1915. The 8th (Service) Battalion was formed at Taunton on 20 October 1914 and came under command of 63rd Brigade, 21st Division. The battalion went to France on 10 September 1915, landing at Le Havre. It is most likely that Sidney went with his battalion at this time. During the Battle of Loos, the 21st Division suffered over 3,800 casualties and took the rest of the year to rebuild. Although the battalion was not directly engaged in any distinct battles until July 1916, the intervening period was one of sustained day-to-day fighting. On 13 March 1916, during such fighting, Sidney was shot and seriously wounded. He died from his wounds on 6 April 1916, aged just 20 years. In its edition of 6 April 1916 the Western Gazette reported "The parents of Private S Masters, Somerset Light Infantry, who live in Park Street, Yeovil, received news on Monday that he had died from gunshot wounds received in action on March 13th. Private Masters, before joining the Army, was employed on the farm of Mr James, Newton, and also at the Gas Works, leaving the works to join the Army". 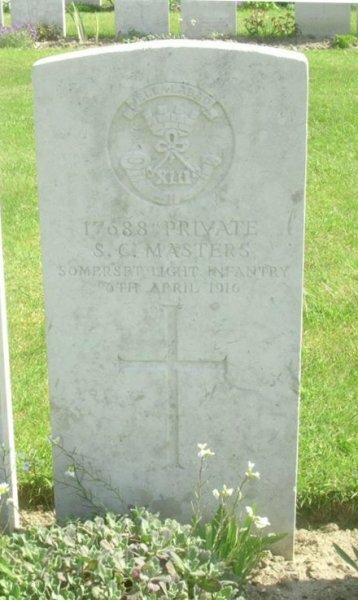 Sidney Masters was interred in Etaples Military Cemetery, Pas de Calais, France - Grave V.A.5A, and his name is recorded on the War Memorial in the Borough. 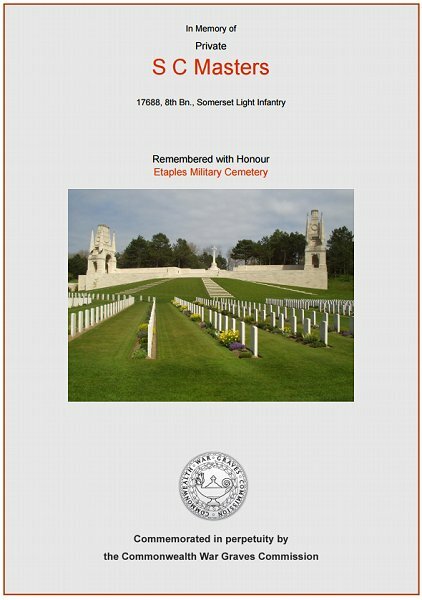 The Commonwealth War Graves Commission certificate in memory of Sidney Masters.